Thank you for registering for The 18th Annual Novo Nordisk New Jersey Marathon Weekend. In an effort to make your participation more enjoyable here is the second in the series of brief weekly messages. Copies of these messages will also be available on our: Website and Blog. Getting to the Start: Carpool and be in the parking lots about 75-120 minutes early, or take the Special NJ Marathon Race Day Train. Click here to register. Post-Race – Getting to your vehicle: Take a regularly scheduled NJ Transit train (doesn’t stop at Monmouth park), walk to one of the parking lots near the Finish Area, or take one of our free buses back to Monmouth Park. Pre-paid parking at Monmouth Park: We strongly suggest this option. Click here to register. Pre-paid parking near the Finish Area: Guaranteed Parking for spectators at Seven President’s Oceanfront Park in Long Branch for $15. Click here to purchase a ticket. Race Day Gear Check: Take advantage of this free service with dry, warm clothing after your race! Race Packet Pick-up: Free at the Expo, paid service on race day morning. Click here to register. Expo Parking: Parking on both days of the New Jersey Marathon Health and Fitness Expo is free and open to the public (Fri 1pm-7pm, Sat 10am-6pm). This parking will be inside the gates of Monmouth Park, in the Grandstand lots adjacent to the Start Line of the Sunday races. Race Day Shuttle Busing: On Sunday the 27th we will provide free shuttle buses from: Monmouth Park Start Area to a location along the race course at about mile 9.5 (which is also about 4 block from the Finish Area and from Pier Village starting at 7 am; Monmouth Park to the Relay Transition Area (loading from 6:45 am to 7 am); and from the Finish Area back to Monmouth Park from approximately 9:15 am to 3:30 pm. Our New ROCstar Program: We were pleased to discover that over 500 people have raced with us in a combination of our full and half marathons, for four or more consecutive years! In addition, we have heard that there are athletes who have race with us for up to 17 years in a row! We want to let each of you know how please we are that you have regularly included us on your spring running calendar. To each of you we offer a sincere Thank You! We have created the ROCstar program to track your accomplishment and to show you some love as you continue to run on with us each year. Click here for a link to the ROCstar Program details. ShapingNJ 5K: In our continued effort to produce a weekend of health and fitness which is open to a wide array of abilities and interests, we have added the ShapingNJ 5K this year. The race will be held on Saturday, April 26th on a USATF certified course and will be a timed race starting this year. It will start and end at the Finish Line of the Sunday races. It will start at 8:30 am on the Long Branch Oceanfront Promenade, north of Pier Village and the Ocean Place Resort. Family Festival & Kids Races: Barnabas Health has partnered with us again this year to sponsor a Family Festival and Kids Races and we are very excited to be working with them to offer this special family focused part of our race weekend. Click here for a link to our website and the details of this fun Saturday morning event, on the 26th. The Barnabas Health Family Festival and Kids Races begin at 9:30 am on the Great Lawn in Long Branch, which is north of Pier Village and the Ocean Place Resort. 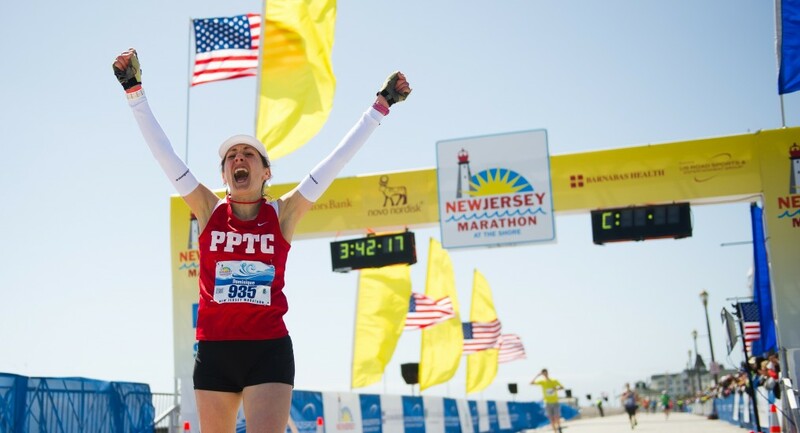 Make it a Shore Weekend: There’s lots to do over the three days of the Novo Nordisk New Jersey Marathon weekend and groups and families are already making plans to enjoy the Shore with us in late April. In fact, several of the hotels on our Lodging page are already full and people are currently being added to the wait list for the most popular hotels/inns, etc. In addition to the ShapingNJ 5K and Barnabas Health Family Festival and Kids Races on Saturday, there is much to do at Monmouth Park on both Friday and Saturday during our Health & Fitness Expo. In addition to picking up your official race packet (bib #, technical event shirt and Sunday gear drop bag), there will be exercise classes and a very helpful, informative, speaker series. More info will be available to plan your day(s) at the Expo soon. Course Update: The Long Branch Half Marathon and Half Marathon Relay course has not changed from the certified 2013 course, therefore it retains its certification for 2014. Please note: the boardwalk along the oceanfront in Long Branch, will NOT be repaired in time for this year’s race, however it is not an official part of the course, even though it was used by some in prior to 2013. Both our Proposed Novo Nordisk New Jersey Marathon course and ShapingNJ 5K course have been sent to the USATF for certification. The New Jersey Marathon Course changes in 2014 are in the two southernmost municipalities (Asbury Park and Ocean Grove). In Asbury Park we are pleased to announce that we expect to be back on the boardwalk this year, however Ocean Grove has not finished repairs to their boardwalk, etc. and we will be using a bridge to enter Ocean Grove, but not to leave it. I hope that this information will help to take most of the pre-race and post-race stress out of your day. This entry was posted in Race Info and tagged Busing, Course Update, Expo, Family, Getting to the Start, Kids Races, New Jersey Marathon Race Director Update, Parking, Race Director Update, ROCstar. Bookmark the permalink. Sarah, The parking tickets will be mailed this week. Sarah, They are being mailed this week.